The men's basketball team watched another one slip away Saturday as they were defeated by the Wentworth Institute of Technology Leopards 70�57 at Rockwell Cage. As in past games, fouls continued to be a problem for the Engineers. Although no players fouled out, Melvin Pullen '98, Godfrey Inniss '98, and John Schaefer '00 all finished the game with four. Coach Larry Anderson was visibly upset from the sideline about some of the "stupid fouls," as he commented, committed on the floor. Fortunately for MIT, Wentworth did their best to reciprocate. The opposition was best personified in Leopard guard Ludger Bain. He was the leader in scoring with 23 points, had four fouls, and shot an incredible 12 for 13 from the line. The game began slowly, with both teams having a lot of trouble getting the ball inside. When the teams' defenses became more porous, Wentworth took the best advantage and secured a 35�30 lead at the half. The second half began the same way as the first, with both teams playing strong defense and coming out fairly even. But again, Wentworth took control. At first, MIT responded behind an electrifying dunk by Inniss but could not get closer than three. 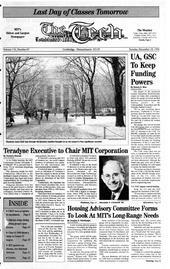 Again, MIT was not able to finish its rally, as the shooting turned cold and the lead expanded to its eventual 13. The loss drops the men to 0�6 and 0�3 in the conference. Among the leading scorers for MIT were Pullen with 16, Benjamin with 11, and Inniss with 10.